Time for another Embellish Color Challenge... to use the colors pictured above along with a decorative border (punched, die cut, decorative scissors), check out the details here. Our sponsor for this week is the fabulous Verve Stamps and you've got to check out the prize... by participating you have a chance to win four gorgeous Verve stamp sets! The stamp set used is Verve's Everlasting Life, such a gorgeous set! I use two different sized scalloped borders, which were die cut using the new PTI Scalloped Borders Dies (LOVE these!!! ), in Sweet Blush and Lemon Tart cardstock. The cross was stamped using Spring Moss ink, then heat embossed with clear embossing powder, for a bit of elegance. Attached a couple Melon Berry buttons, tied off with white silk ribbon, to the scallops. Using a cheery color combo of Lemon Tart, Aqua Mist, New Leaf, Dark Chocolate & White. The scallops were cut using the Small Scalloped Border Die. An Aqua Mist cardstock strip was stamped, in New Leaf, with Background Basics: Tin Types. I am really loving the look of the New Leaf on Aqua Mist! Stamped the sentiment (from Everlasting Life) in Dark Chocolate, then emphasized it with a New Leaf cardstock strip. Finished the card off by adding a few layers to the Lemon Tart tulips, for a bit of fun dimension. After creating both of these cards, I am definitely ready for Spring! Thanks for stopping by and I hope you give this challenge a try. I can't wait to see what you all create! I'd like to start off today, by sending out a huge Thank You to each and everyone of you who left me such kind and encouraging words yesterday. Definitely made for a fun day, reading what you all had to say. Now onto the February Papertrey Ink Blog Hop. 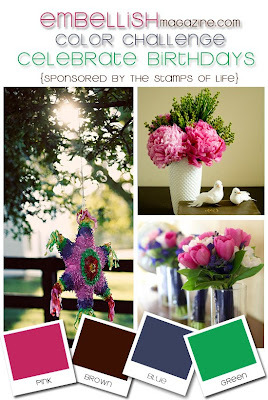 This months blog hop is in honor of the PTI Design team. The challenge is to select a project they have created, use it as inspiration and recreate a project with your own spin, making it unique. I have always found the ladies of the PTI Design Team to be full of talent and have always looked up to them for inspiration. I count it as a huge blessing to be apart of such a talented team. I changed up the layout and the color combo (added Aqua Mist and used White instead of Rustic Cream). Dawns butterfly was created using a larger scaled flourish (from Fancy Flourishes) and its mirror image, I went with two smaller flourishes and the coordinating mirror images. The Aqua Mist card base was stamped, in Versamark, with an image from Background Basics: Tin Types. Embellished the butterfly with Berry Sorbet vintage buttons (strung with yellow embroidery floss) and a Lemon Tart bow. Stamped the sentiment, from Asian Fusion on a Lemon Tart strip and trimmed the edge with scalloped scissors. Thanks Dawn for such great inspiration and thank you for hopping by! Enjoy the Blog Hop! Hello and welcome, friends! Who's ready to celebrate?! I know I am! It's Stamp It! Cards week and I am so exciting to be a part of the Stamp It! Cards Week Blog Hop! Have you seen the Stamp It! Cards magazine yet? It's wonderful and chocked full of amazing creations, what a blessing it is to be apart of it. This is my first time ever seeing my cards in a Paper Crafts issue. Once the issue became available, I searched my little town high and low for one, with no avail. What torture that was! It was definitely worth the wait though. Now here is your chance to participate in the fun! Moxie Fab World blog and Paper Crafts Connection blog have joined together to celebrate, by hosting a stamping challenge called The Olympics of Stamping. All you have to do is create and submit a stamped card in the following themes: Birthday, Thank You, Thinking of You/Hello, Love and Season's Greetings. These categories also happen to coincide with the Stamping Royalty Contest. So, once you've submitted your challenge cards over at the Moxie Fab World Blog, be sure to send it into the magazine contest as well. I stamped an Aqua Mist cardstock strip with Background Basic: Tin Types (in Versamark) and attached it to a White cardstock strip. Use the Butterfly Die to cut a negative space from the strip and mounted white cardstock, stamped with button images from Studio Style (in Aqua Mist and Berry Sorbet), behind it. Attached it over a Kraft Small Scalloped Border and card base, then wrapped with embroidery floss. Leave each one of them a comment (including the Moxie Fab World), to give you 12 chances to win a fabulous prize! One lucky winner will win a prize of 12 stamp sets from My Cute Stamps! Thanks for hopping by, hope you have fun!!! Hello everyone and happy Monday! Popping in to share a card that was created using Dot Spot and Butterfly Dream... This color combo is fairly new to me. I don't usually use purple, but lately I've been trying to incorporate it into my usual color combos. The Kraft base was stamped using one of the butterfly background building images, in the Butterfly Dreams stamp set. Attach a Spring Moss strip, embellished it with buttons and then stamped the sentiment in Dark Chocolate. I stamped the large Dot Spot image in Aqua Mist, cut it out using my circle cutter and stitched a few Plum Pudding butterflies around the Spring Moss button center. Mounted the circle onto a card base measuring 5 1/2" X 3 3/4" so that when attaching it, I could extend it over the edge about a half an inch. The entire card measures 5 1/2" X 4 1/4" and still fits in a regular A2 envelope. Hope you enjoy your day and have a wonderful start to your week! Hello and happy Friday!!! Today's card uses a little Dot Spot for you... Stamped the Dot Spot images in Aqua Mist, Spring Moss & True Black, across a white cardstock square and rounded the bottom corner. Attach a Spring Moss cardstock strip along the bottom to help emphasize the simple sentiment (from Fillable Frames #1). Then mounted it all onto a True Black card base. Pretty much kept the supplies to a minimum today; just cardstock, stamps and ink. Thanks for stopping by today, hope you have a great day and a wonderful weekend! Hello my friends! Aren't these flowers from the Year of Flowers: Violets stamp set just gorgeous! I just had to play with the set again. My last violet card showcased the flower as the focal point, this time I used the image as more of a background... Stamped the violets and leaves in Pure Poppy onto Berry Sorbet cardstock and pulled out my embroidery floss to tie a few french knots onto the flower centers. Love the texture the french knots add! Fillable Frames #1 and the matching die are a must have (IMO), the possibles with them are endless. I die cut the frame from White cardstock, stamped it and the sentiment in Pure Poppy. Stamped an additional violet into the frame, in Berry Sorbet, then embellished with french knots and a ribbon tab. I heart this sentiment! Used the jar full of buttons, from Studio Style, to stamp in a rainbow of colors. A great way to use this set and add a variety of color to your card, with out having to color it in. Super easy too! To stay with the rainbow color scheme, I created a rainbow ribbon border. Just loop ribbon tabs and attach behind the stamped panel. I made sure to use a variety of different ribbon types, to give the card fun texture and interest. Such a cheery card, it makes me happy!!! Hope you all have a fun day! I Heart Paper Crafting! : Card Measures 7" X 3 1/2"
Thought I would share a few more if my release projects today... Here is a project I created using Dawn McVey's newest stamp set Studio Style. Love this set! I have a couple more cards using this set to share with you soon! I like to call this project... Card Making Essentials Kit. Just a few card making supplies (pattern paper, pre-scored cards, envelopes and embellishments) placed nicely into a reused stamp set box (the boxes everyone's stamps come in, that we all just can't throw out, lol. ), embellished with a simple wrap to match the coordinating card. 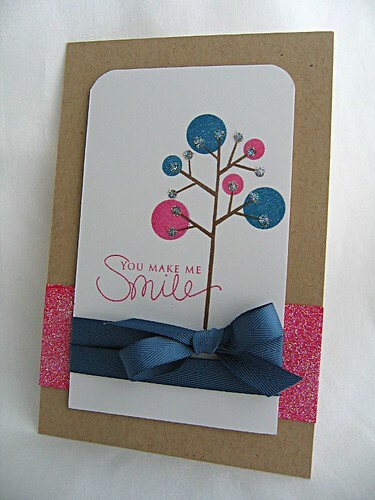 Makes a great gift for a newbie or an experienced card creator! The ribbon image was paper pieced, stamped the ribbon in True Black onto White and Raspberry Fizz cardstock, cut out and pieced together. A close up of the wrap made to match the card. Here is Asian Fusion combined with a unique color combo of Melon Berry, Pure Poppy, Dark Chocolate & White. The vase was created by stamping the solid flower border image over the liner vase image, then cutting it out and attaching it to the card. Embellished the flowers with more of those fun french knots. What a gorgeous set Butterfly Dreams is! Niki Estes did an amazing job of creating so many different and beautiful butterfly images. Think of all the possibilities! Used Background Basics: Tin Types too. You can get all the details at the PTI gallery here. So glad you could visit me today! Have a wonderful day! It's been an amazing and fun month so far, with all the PTI anniversary festivities taking place. Hope you all enjoyed the release! Can't wait to see what everyone creates with their new goodies! Just though I would share some of my release creations with you today... This card uses the Take Three: Spring set. A very versatile set. Perfect for creating any type of card and I chose to create a masculine card. Flowers of the Year: Violets is such a gorgeous set! Perfect for coloring, creating a gorgeous background or using as is. I stamped the flower as is and then embellished it with a few french knots in the center. I took a completely different approach to the Luck Of The Irish set. Instead of the usual green colors of the holiday, I chose to go with a love/red theme and this sentiment fit perfectly. This card, using Fillabe Frames #1, is my favorite of all my release projects. I used the frame image to create the patterned paper and incorporated a flower, from Asian Fusion, into the open spaces between the stamped frames. Check out the PTI gallery here for all the details. Thanks for stopping by today, hope you have a great start to your week! It's official... Wplu9 Design Studio is now open for business! Stop by the new store and check it out! Today I wanted to share a fun card, using Love Birds (which is already on sale), perfect to give to a dear friend and to let them know that you are thinking of them... The set comes with two branches, which I combined to create a tree. Stamped the large branch vertically, masked it off and stamped the smaller branch off of the tree trunk. The leaves were added by stamping just the ends of the heart flowers, in Spring Moss, onto the ends of the tree branches. This tree branch makes for a perfect bird perch. The perch was created by stamping the ends of the smaller heart flowers, with Spring Moss, on ether side of the perch. For a bit of dimension the bird, branch and heart leaves were stamped (in Spring Moss, Dark Chocolate & Plum Pudding) onto scrap cardstock, cut out and adhered with dimensional adhesive. This really is a versatile set, check out the entire Love Birds set and see for your self what images I used to create today's card. Thanks for stopping by today, hope you are having a great weekend! It's time for another Embellish Magazine Challenge! This time the challenge is a little different. 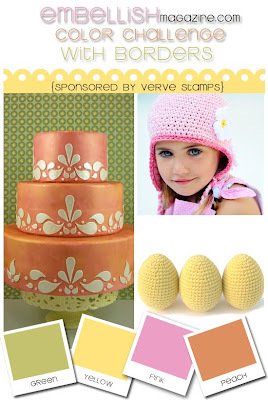 Instead of having to incorporating a specific embellishment, the challenge is to create a birthday themed project using the colors pictured above (Isn't that inspiration photo just gorgeous!). So feel free to use any embellishment your heart desires! The single cupcake image was just too cute for me not to use! Stamped it in Raspberry Fizz, Enchanted Evening & New Leaf. Here's another use for those huge buttons we never can figure out what to do with! The sentiments in the set are completely broken up into individual word. Makes creating the perfect sentiment in the perfect spot, super easy. You have until February 25th to complete your projects and post them over at the Embellish Magazine Challenge blog. The winner will receive the HappyBday2You stamp set (the same stamp set that we, the Design Team, used on our challenge creations). Can't wait to see what you all create! Welcome to one of the *official* stops on the Papertrey Egg Hunt! a hidden egg that's one-of-a-kind. Perhaps there are more than one or maybe even none! The Challenge is yours, enjoy and have fun! If you are starting out here, make sure that you stop by Nichole's Blog to read about all the details along with the GRAND Prize affiliated with this fun contest! 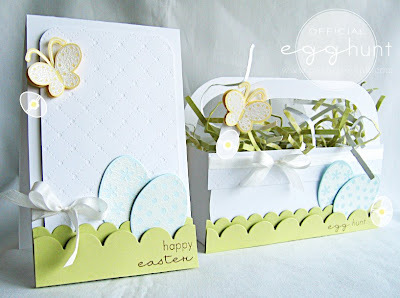 Start by cutting out two basket templates (this is one of the new Click Simple Templates created by Kim Hughes and it's available on the 15th), stamp and embellish as desired, then set aside. Cut a strip of cardstock that measures 10" X 3.5". Score at 1/2" along each long side and at 2 3/8" along the short sides. Cut a notch from each scored corner and you should have a piece like the one pictured above. Fold at the scored lines and adhere basket sides with Score-Tape. Here is the completed basket. The scalloped grass was cut using two sizes of the new PTI exclusive Scalloped Dies. Used the new Tin Type Impression Plate for the white cardstock strip and wrapped it with 1/4" Silk Ribbon. The shredded paper was created by cutting thin strips of coordinating pattern paper from the Pretty Pastels collection. Be sure to coordinate your card to complete the perfect gift ensemble. Since I crated the project for my soon to be three year old son, I die cut and heat embossed white eggs from Blue Shimmer Cardstock (Pink Shimmer Cardstock would be a great option for girls), then tucked them into the scalloped grass. This cute little butterfly was stamped and heat embossed twice (onto Lemon Tart cardstock), cut out, layered and attached to both the basket and card. Be sure to stop by the other PTI Design Team ladies blogs to see what beauties they have created! Egg Hunt Gift Basket & Card: Card measures 3 1/2" X 4 1/4"
Hello! Thought I would share another You're Dandy card today... Created the cloud pattern paper by stamping the outline cloud in versamark and the solid cloud in white. Punched the edge of the pattern paper with Embossed Curves Border Punch, attached it over a white cardstock strip, onto the kraft card base and wrapped with Raspberry Fizz grosgrain ribbon. Isn't this kite just too cute?! I love how Courtney design this image. She created the kite string to be flexible, so it could be curved giving the kite some movement. Stamped the kite, bows and the sentiment onto a punched circle, which fits perfectly over the curves of the punched border. Stamped the kite a second time on Raspberry Fizz cardstock, cut it out and adhered with dimensional adhesive. 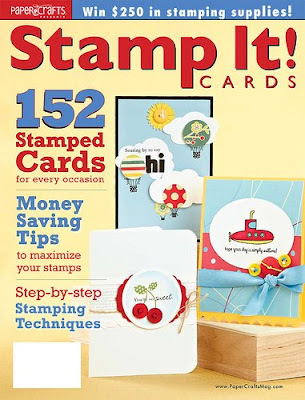 Stop on by Courtneys blog for the latest on this stamp set and for more inspiration. Have a wonderful day! Are you all enjoying the Papertrey anniversary festivities?! How exciting is the new Fillable Frames Collection by Heather Nicholes & Color Couture by Dawn McVey?! All the possibilities and just think the actual countdown begins tomorrow!!! In honor of Heather's and Dawn's new collections, Nicole had asked the Papertrey design team to create a 4' X 6' card front (using our favorite color combos), which she will frame and then give to the winner of today's color challenge. The color combo pictured above has become a new favorite of mine. The first time I ever used the combo was only a month ago on this card. I love to add the bold colors of Raspberry Fizz and Enchanted Evening in small amounts so that they pop off of the more neutral colors of Kraft, Dark Chocolate and White. Making sure to place or use the bold colors in a way that helps direct your eye across the card. I created a fun little stamped polka dot tree using the tree image from Beyond Basic Borders and polka dots from Polka Dot Basics. Glittered a Raspberry Fizz cardstock strip, attached it to a Kraft base under the tree image panel. Another new favorite of mine is to, wrap twill ribbon around twice before tying it into a bow. This is a great way to utilize the thinner twill ribbon when a wider ribbon is needed (but you may not have). Stamped one of my favorite sentiments, from Signature Greetings. 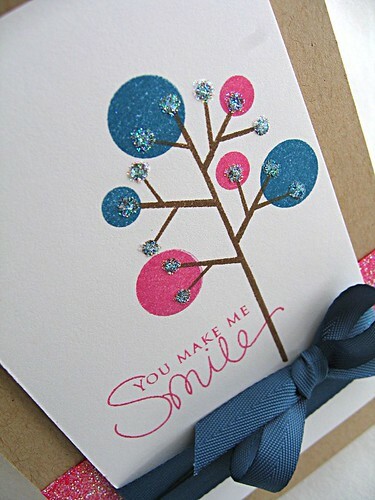 Then added a few touches of glitter, to the ends of the tree branches, to finish off the card. I hope you get a chance to give this color combo a try, it really is a fun one! Thanks for stopping by! Hello and happy Monday my friends! I have another Wplus9 Design Studio card to share with you today, showcasing the soon to be released Just A Note stamp set. The set includes an elegant yet fun flowing line of music, which I stamped on either side of the circle cut out. The sentiment was stamped and heat embossed in white onto Pure Poppy cardstosck, then adhered under the circle cut out. Isn't that font just gorgeous, it's a perfect fit to this gorgeous set. If you haven't seen them yet, check out Dawn's creations using this set. Also, stop by Karrianne's and Elise's blogs to see their gorgeous cards using Love Birds. Then stop by Savitri's blog to see all the wonderful projects she has created. Thanks for popping by today, hope you have a great start to your week! Lots of exciting thing are happening with Papertrey Ink over at Nicole's blog! You must stop by and check out some of the latest news! Today's announcement is, a new line of fabulous felt made from %100 wool and available in Papertrey's exclusive color spectrum! The second announcement of the day is, Papertrey's sponsoring the latest CPS sketch challenge. The latest challenge, over at Nichole's blog, is to use their sketch and to incorporate some felt. Some of us PTI girls are playing along as well... Here is a sneak peek of the soon to be released (this February) Spot Dot stamp set. Stamped the dotted circle in Raspberry Fizz & Aqua Mist onto cardstock squares, cut them in half and adhered halves together. The sentiment (from Shapes by Design) was then stamped in True Black. The flower was hand cut from the new black felt, stitched a button onto the center and then attached to the stamped circle. Be sure to stop by the CPS blog , check out the sketch and take a peek at a few of the new sets!